Browse: Home / Uncategorized / Domique and Family Came to Dinner the end of November. 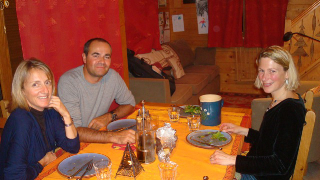 Domique and his family were finally able to make it over for a visit and a meal with us at Chalet La Frasse. We had a great time and the kids played quietly while we chatted and caught up. Both he and his wife spent a fair amount of time in the US when they were young and learned to speak english very well. Dominique’s ski shop, Sanglard Sports is the premier rental shop for alpine and ski touring in Chamonix–it’s easy to reserve on line: (www.rentski.com). They also sponsor the new Ski Mountaineering club that Nina started with the Chamonix Club des Sports!